Saluton kaj bonvenon ĉe la Bostona Regiona kaj Urbega Esperanto‐Grupo! Ni estas grupo por Esper­anto‐parol­antoj, lern­antoj kaj interes­uloj en Bostono kaj ĉirkaŭaj urb(et)oj. Ni renkont­iĝas kutime monate de 18:30 ĝis 20:00 . Bonvolu vidi Meetup por venontaj datoj kaj lokoj. En tipa renkont­iĝo, ni kun­babilas kaj Esper­ante kaj en la angla; ni praktikas leg­adon per Esper­antaj noveloj; ni el­montras kreem­aĵojn; kaj ni manĝas! Ni bon­ven­igas egale kaj komenc­antojn kaj spert­ulojn. Bonvolu sekvi nin ĉe Facebook aŭ Meetup, babili kun ni per Telegram, aŭ ret­poŝt­umi al ni por pli da informo. 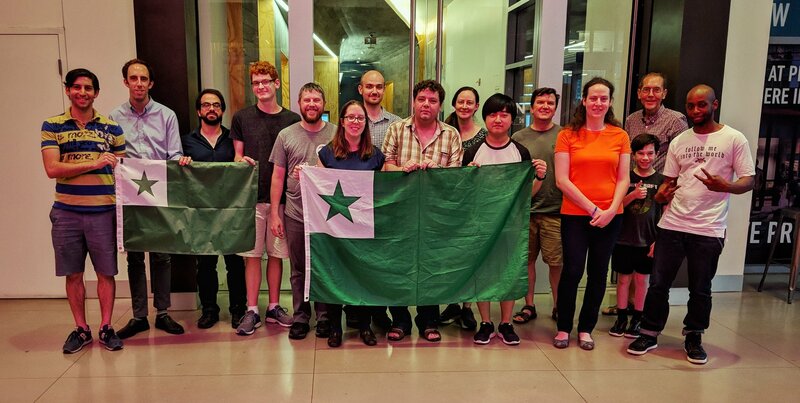 Hello and welcome to the Boston Regional and Metropolitan Esperanto Group! We are a group for Esperanto speakers, learners, and enthusiasts in the Boston area. We typically meet monthly from 6:30 PM to 8 PM . Please see Meetup for upcoming dates and locations. In a typical meeting, we chat together in both Esperanto and in English; we practice reading with Esperanto short stories; we share creative works; and we eat! We welcome beginners and experts alike. Please follow us on Facebook or Meetup, chat with us on Telegram, or e‐mail us for more info.